The power of Epic's Unreal Engine is both a blessing and a curse. On one hand, it allows talented fledgling artists to create amazing sequences which are arguably on par with the efforts of professional developers, but on the other it teases viewers with tantalising glimpses of projects which are unlikely to actually happen. 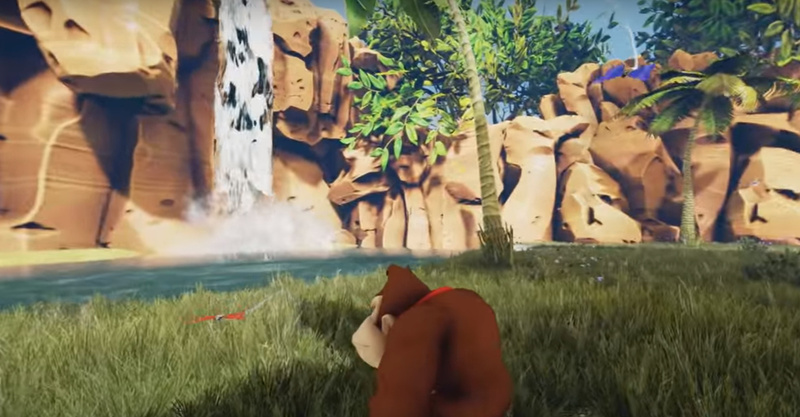 We've already seen Zora's Domain, Kakariko Village and The Temple of Time from The Legend of Zelda: Ocarina of Time painstakingly reconstructed using Unreal Engine, and now we've got a replication of Donkey Kong 64's opening level which looks so lush and inviting it's actually painful to watch, because we'll probably never get to actually play this beautiful vision. Give it a look and share your thoughts by posting your impressions below. This is one HD remaster we'd love to see happen soon. Wow this one actually doesn't look too far off the actual art style Nintendo uses! The people behind these are improving with each video. Normally I'm not impressed by most of these recreations but this one looks really nice. Looks actually pretty good, still a diamond in the rough though... I wonder what they will do next. Oh my god. Why did I click here? Why did I watch this? Why? A DK64 sequel is my current dream Nintendo game. This is too much to take. Videos like this just serve as a frustrating reminder that since 2010 when Mario Galaxy 2 came out, Nintendo fans haven't had a technologically boundary-smashing platformer. Another video in NL's long series of "here's a classic stage remade with modern technology, just to remind you how good classic N64/GCN games would look in Unreal Engine" articles. This one is good though. Like, real good. *At least, that's what I think. @JohnnyC To be honest, I think Rayman Legends is simply beautiful game. Sure, it's a 2D game, but everything about it looks great; it's sharp, it's charming and it's colourful. @ricklongo I would love another 3D Donkey Kong game too! The video made a good balance between realistic graphics and a cartoony style for me. This is what I'd like a modern 3D Donkey Kong game to look like. That Donkey Kong movement, tho ... Oh, who am I kidding? It looks absolutely beautiful! I think if you showed me only the Donkey Kong part, I would believe it to be a real new 3D Donkey Kong game! @KoopaTheGamer I completely agree there have been very good platformers, and Rayman Legends is probably among the best 2D platformers ever made. I want to see a game that pushes forwards in other ways too. To be honest the best examples I can think of in recent memory are Tearaway and Gravity Rush on the Vita, which both owe a debt to Mario Galaxy but made their own thing and did something new. Even I would play this game again if it looked like that and I'm not the biggest fan of this game. I believe it was one of Rare's weakest outings. Couldn't get into DK64, as hard as I tried. Maybe this would make me look again. HD graphics really can make a game more immersive. DKC Returns isn't the same as the original DKC control-wise and gameplay-wise, unfortunately. I didn't enjoy the 2 new DKC games as much because of the loose controls. Even though I completed the Wii one, I haven't touched Tropical Freeze in ages (played up to World 6). Even DK Jungle Beat was more engaging and fun to play. I also think that DK64 was a weaker Rare game (it felt too much like Banjo-Kazooie than a DK game) but seeing this graphic demo I'd rather take a DK64 sequel/remake than another 2D platformer. This is the firs tone of these I actually like. I could totally see Rare going for this realistic look. I'd be up for a DK64 sequel/remake that looks like this. Spyro was the best imo. Perfectly matched its style. I don't really like how the camera warps some of the objects when viewed at an angle, or how it moves. And anyone who thinks this looks great should check out Pikmin 3. Those graphics blew me away when I saw them. I think those are way better than these graphics. This looks pretty great but it just doesn't seem to capture the same magic of the original for some reason, couldn't say why. On another note, DK64 is one of my all-time favourite games and this just reinforces my opinion that they need to do a sequel! Nintendo, buy back Rare, dang'it! DK with this kind of gfx quality would work fine on Wii U.
I just went bananas and now my back hurts. I don't mean to detract from any hard work or talent on the part of whoever makes these - but whenever I see one of these videos - they never LOOK like Nintendo games, the art style, how the camera moves, the character animations/walk cycles etc etc. Nintendo (or any other dev) has its own style and way of doing things. I feel like throwing Nintendo character models into Unreal/Unity/whatever is a bit of a futile exercise - their time and ability could probably be better spent on original creations. Creativity/imagination and technical abilities are not the same thing. Great grass, but everything else looks like a cartoon after 100 hours of XCX. Reminds me of the 1st 3D Rayman game - but that's due to the butterflies I think. DK really stands out - in a bad way - against that grass, though he looks good w/ the background rock walls and trees. Anyway, always up for a 3D platformer, and this one looks good. Does Yooka-Laylee have recent date updates? They said it was Oct 2016 but that was back in July, probably 2017 by now. I wonder if Playtonic has an NX dev kit yet? 🙄 Personally speaking, I despise Unreal Engine. Everything that's used it has looked garish and unimaginative to me. It's overrated, glossy garbage, in my opinion. Retro Studios should hire that guy... IMMEDIATELY! I've been playing through this on the VC lately and was thinking to myself how I'd definitely buy an HD remaster if one was ever produced. I love DK64, but there are definitely areas of it that have aged poorly. Honestly, I'm shocked they haven't redone it yet, seems like the perfect game for an update. Wow, that looked amazing. By far the best one they've done I've seen!! I've never played the game TBH, it's the only Nintendo/rare game I've not played through and that bugs me. I guess if I play it I've run out of rare classics and that's so sad so I'm avoiding it....well an HD remastered version would give me a push I guess? @NintyMan basically my thoughts. Either a remake this beautiful or a sequel, I'd love either. This is one of my top ten games. So much nostalgia. I don't care much about these types of remakes, but damn if that DK64 music doesn't put me in a mood. A good mood. The kind of mood that gets a man through the day. The kind of mood that makes a man want to play DK64, only to rage-quit and smash the controller into a thousand pieces after going insane from the endless collecting. Man I love this game. Beautiful! Old school Rareware is just the thing to pull the heart-strings. I would love too see an HD open world Donkey Kong game. Looks good. Wish Nintendo would make lush, big platformers like they used to. Such a great game. But as amazing as that looks, the original holds up surprisingly well for me. The only real problem I have is the stiffness of the DK model and the clipping of the grass through the model, but this is not a AAA team making this, and it's for fun, not for a real release. Just hearing the music again, arranged mind you, brought a smile to my face. I will admit tho I was a little disappointed when Cranky's cabin didn't pop up out of nowhere when DK approached the spot. Good but remake Donkey Kong (Game Boy version) in this style and I will be more impressed.